I like how this card has a lot of flavor that isn't being conveyed by the flavor text. He's the chief engineer, so he organizes your other creatures and gets them to help working on that big project you've got in mind. On the other hand, part of me wonders if we won't be seeing this as the second coming of Affinity for Artifacts, which was so ruinous to Standard that it prompted a complete overhaul of the philosophies behind Magic: the Gathering as a whole. There's no doubt in my mind that thousands of Magic players who piloted Affinity back in those days and are still longing for that particular flavor of adrenaline rush will try their damnedest to make this work, but will it be the same? Probably not. First of all, affinity is an aspect of the cards it's on at all times, while Chief Engineer only works when he's in play. That means you can't play out your hand on Turn One-- you need to actually draw and cast the Engineer, and your opponent can (in theory) stop your shenanigans from getting out of control by killing your 1/3 creature. Second of all, affinity was so hard to stop because it snowballed so easily. Play an artifact with affinity for artifacts, and you now have one more artifact reducing the costs of your artifacts. Giving artifact spells convoke is a little different, since it's creatures that are helping you cast them. True, there is such a thing as "artifact creatures" but it's still not quite so explosive since you need to tap the creatures that are helping you pay for more artifacts, which means they aren't attacking, blocking, or using tap abilities that turn. Time will tell how strong this ends up being, but I fully expect it to be popular. 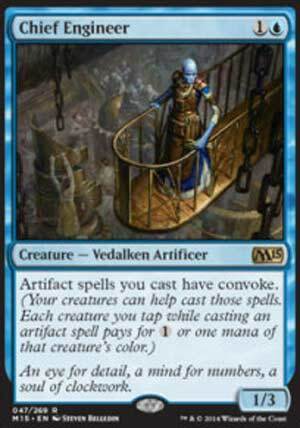 Artifact spells are good candidates for convoke - perhaps the best, since it doesn't matter what color creatures you use and since some of them are fairly expensive for their effect. On the other hand, in casual settings, you have access to artifacts that actually generate mana themselves, and thus the Engineer may seem superfluous. When you have the possibility of reducing something's cost - anything's cost - to zero, it's always going to draw attention, but it will take some experimenting to find the right deck for this guy. Today's card of the day is Chief Engineer which is a two mana Blue 1/3 that gives Convoke to artifact spells that you cast. This is an interesting cost reducing effect, particularly in swarm or token builds that use Coat of Arms or similar enhancements and of course primarily artifact builds. The 1/3 body is solid enough and overall this is a very playable card in the right deck which means it should see play across multiple formats and even reach the Competitive level as acceleration for an almost Affinity style design. In Limited the value of this purely rests on how many usable artifacts are in your pool in addition to the strength of your Blue cards. Splashing it is possible, though with few or no worthwhile artifacts there would be little benefit. A risky first pick in Booster that should only be taken in a weak pack or if aiming aggressively for an artifact build that may not be feasible. In Sealed it depends on the other cards and is playable as a 1/3 for two if needed, plus can be used for minor psychological impact if an opponent tries to predict your plays.